Adina Prestige Champagne Flutes Set of 2 (P/N 4900175). The Spiegelau brand is synonymous with..
Lucca Cafe Flute 6 Stems (P/N 150.01.00). These stunning flutes feature a delicately-etched sc..
Lucca Champagne Flute 6 Stems (P/N 150.01.01). These stunning machine crafted glasses are lead..
Riedel Sommeliers Champagne Glass (P/N 4400/08). The classic shape of the Somme..
Riedel Sommeliers Vintage Champagne (P/N 4400/28). From the chalky soil of Northern Franc..
Riedel Vinum Champagne Wine Glasses Set of 2 (P/N 6416/08). This tall, narrow flute&..
Schott Zwiesel Tritan Diva Champagne Flute (P/N 6.1041). Made from lead-free, titanium-based gla..
Schott Zwiesel Tritan Forte Champagne 6-Pk (P/N 7.111989). 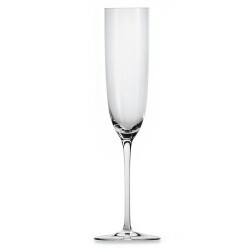 As sparkling and beautiful as they ..
Schott Zwiesel Tritan Pure Champagne / Sparkling Wine Flutes 6-Pk (P/N 112 415). The Pure Coll..
Spiegelau VG Champagne Coupe 6 Stems (P/N 451 00 08). Lead-free glass. Height: 6.5 inches. ..
Stölzle Grand Cuvee Champagne Set of 6 (P/N F 210/29). Machine-made with no lead, these glasses..
Trumpet Champagne Flutes and Glass Ice Bucket Set (P/N 17337). Trumpet Champagne Flutes Set of ..
Ultima Champagne Flutes - 6 stems (P/N 200 00 29). Favored by winery tasting rooms, Ultima Ste..